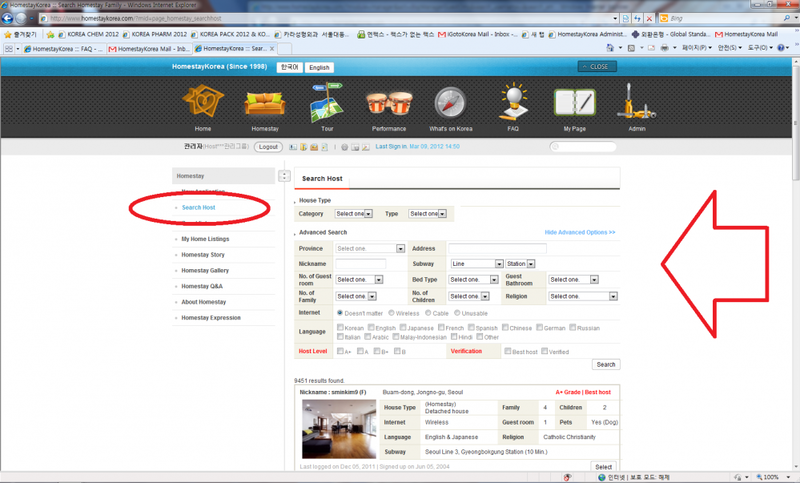 HomestayKorea ::: FAQ - For Guest - How do I search for hosts? How do I search for hosts? Searching for a host requires that you already have an existing homestay application (as a guest). For more information on how to make a homestay application, check this link. To search for hosts, login and click on the couch icon labeled "homestay". Next, you should automatically be directed to the "Search Host" section, where you may search for hosts according to your needs and specifications. Also, hosts may check your application and invite you for homestay as well. Lastly, if you have difficulty searching for a suitable host, we can recommend some host families for you if you prefer. - You can search by yourself on our site. - When you fill out the homestay application, host families can see it and also invite you as a guest. - We, as homestay coordinators, can recommend some suitable families for you if you prefer. * You can check host lists on "my page" - "my reservation" after signing in on your profile. When you click the host name, you can see more details with some pictures. Homestay Application How do I search for hosts?